The shoulder is a ball and socket joint. The rotator cuff is a series of four separate muscles (1: supraspinatus, 2: infraspinatus, 3: teres minor, 4: subscapularis) that converge together and pass over the shoulder joint much like the cuff of a shirt sleeve passes over your wrist. Calcific tendinitis of the shoulder is a condition in which calcification develops in one of the tendons of the rotator cuff. 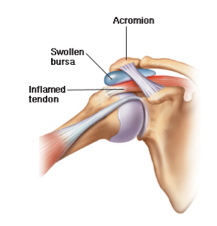 This most commonly affects the supraspinatus tendon. Typically there is no injury or obvious cause for the development of the calcification in the tendon. No one really knows the precise reason for the development of calcification. Calcific tendinitis of the shoulder tends to be more common in women and in patients with a history of diabetes. The calcification can lead to inflammation in the affected tendon as well as the bursa which lies over the rotator cuff tendons. Some patients with calcific tendinitis will be completely asymptomatic. Many patients, however, reports sudden onset of severe shoulder pain that often begins for no apparent reason. 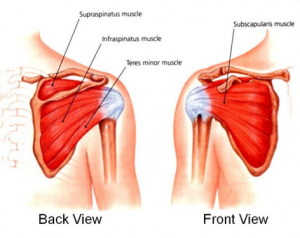 The pain is typically located on the front and outside part of the shoulder. The pain is often worse with certain movements, including reaching overhead or to the side. In addition, the pain may be worse at night and may awaken the patient from sleep. Some patients with calcific tendinitis report stiffness in their shoulder. The diagnosis of calcific tendinitis is typically made by a combination of the patient’s history, the findings on physical examination, and x-rays. Very early on the calcific deposits may not be visible on plain x-rays. Notice calcium deposits have developed in the rotator cuff tendon. calcification. This tends to expedite the recovery process. Some patients may require a second injection if the first injection is unsuccessful. If this conservative approach fails, surgery may be considered, but this is uncommon. During surgery, the calcified deposit and inflamed bursa are excised. Click below to watch a surgical video showing Dr. Farber decompressing a calcific tendonitis deposit. If the void left in the rotator cuff tendon by removing the calcified deposit is large, a rotator cuff repair may also be required at the time of surgery, but this is uncommon. Click Below to hear Dr. Farber provide an overview of calcific tendonitis of the rotator cuff. Click Below to watch a surgical video showing Dr. Farber decompressing a calcific tendonitis deposit. Dr. Farber performs this procedure using the latest cutting-edge minimally invasive arthroscopic techniques. 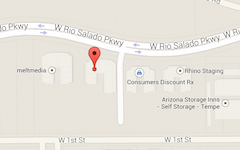 Most insurance is accepted at Phoenix Shoulder and Knee with appointments readily available.